That can stick in your mind and become infinite. I began my professional career in 1989 as a percussionist in the band Savage Rose – and played on the album Moonchild, EMI 1992. Since then I’ve played in many orchestras and in theatrical contexts, both as a drummer and percussionist. I participated in the inter-Scandinavian project NORDICAE, which resulted in the album “The Strength of the Runes”, with Veslemøy Solberg, Sven Ohrvik, Rune Arnesen, Edvard Askeland, Eivin Aarset and Niels Petter Molvær. Composed and played music for the theatre performance “Mac&Beth”, a variation on Shakespeare by Gerz Feigenberg, staged at Theatre La Balance in 1997. I have, in collaboration with saxophonist Agergaard, composed and played the music to H.C. Andersen’s fairytale “The Snow Queen”, a play directed by Marc van der Velden at Theatre La Balance. In 1999, I played music for the joint Nordic project “The Ship” (Skibet), which toured in Denmark, Norway, Sweden and Greenland. Marilyn Mazur composed the music. In 1999, I played with the Sami joiker, Inga Juso. The duo played in Katuaq Cultural Centre in Greenland. That same year, I began collaboration with pianist Arne Forchhammer. The trio released the album Assimilation Trio 2 in 2000 and the album Pianomania in 2002. The trio has toured in Denmark, France (Marseilles, where the trio played at the festival Des cinq continentes), Germany, Iceland and the Faroe Islands. In 2000, I became a member of Marilyn Mazur’s Percussion Paradise and the orchestra premiered at EXPO 2000 in Hanover. With this orchestra I participated in the Jazzpar concerts in 2001. In November 2005, the orchestra played on the Royal Theatre’s Old Stage to mark the 100th anniversary of the Norwegian-Swedish union’s dissolution. In summer 2006, toured with Brazz Brothers and played at Stiklestad, Sandefjord and Molde Jazz Festival. I played percussion for the ballet “Triumph of Death” (Dødens Triumf), which was revived at the Øster Gasværk in 2002, with Vivi and Flemming Flindt as instructors. In 2002, I composed the music and produced a film based on a DNA molecule for Novo Nordisk. In collaboration with vibraphonist Tineke Noordhoek, written and composed music for “The Marshwoman ” (Mosekonens Bryg), a musical adventure site specific for children. Toured in Denmark and Germany. Supported by the City of Copenhagen and Sonning Foundation. Composed the music for the play “A Journey in Text and Tones” (En rejse i Tekst og Toner), with actress Anne Karina Nikolajsen at Kafcafeen in Copenhagen in November 2004. Composed and played the music for the Odense Theatre’s performance of “Ghost Trail” (Skyggespor), in connection with the 2005 H.C. Andersen year, directed by Jonathan Cook. Played with Martin Hall’s orchestra in 2005. The concert at Hindsgavl Castle is released on the album Hindsgavl 180605. I participated in the project LJOD with Agnes Buen Garnås, Ruth Wilhelmine Meyer, and Marilyn Mazur. Toured Norway in 2005 and 2007. Since 2005, I have worked with bassist Ida Bach Jensen. Together we have staged a joint work at Sofiebadet in Copenhagen, as well as playing music for children. Recently, we have jointly composed and played PIP concerts, which are for children aged from 3-7 years old. In the spring of 2006, I composed and played the music for the show 1864 at the theatre House of Asterion (Asterions Hus), performed at Plan-B, with Peter Kirk as director, and later toured in Denmark and Germany. In 2006, I played at the Førde Folk Music Festival (Førdefestivalen) in Norway. These concerts were of my own improvisation, in collaboration with poet Ivar Overdal and a duo concert with the Sami joiker, Inga Juuso. In September 2006, I was invited to the Måren Festival and played with, among other people, Terje Isungset and Arve Henriksen. Staged KALD in 2007 at Plex in Copenhagen, with director Rolf Heim. Lars Andreas Haug, Ruth Wilhelmine Meyer, and Ida Bach Jensen performed, as well as others. Composed and recorded, in collaboration with Stine Michel, the children’s album “Troll Rose og Drum Lisa”.” (Troldrose og Trommelise) and have toured and played with the musical tale all over Denmark. Contributed music to the documentary film “Ekelöfs Blik”, 2009. Composed music for the French/Kyrgyz film “Tengri, the blue sky” (Tengri, le bleu du ciel). The film was shown at the Cannes Film Festival 2009 and the Cabourg Festival, where it won various prizes. Tengri had its cinema premiere in Paris on 28 April 2010. Composed and played at the Louisiana Museum of Modern Art’s New Year Concert 2009 for classical musicians with Gitta Maria Sjøberg as soloist. Participated as a percussionist in Klaus Risager’s acclaimed work “BEHIND 7 DOORS” (BAG 7 DØRE), which was performed at Kaleidoskop in Copenhagen in February/March 2009. In collaboration with Jesper Siberg, composed music for the theatre production of “House of Asterion” (Asterions Hus), which premiered 12 June 2009, directed by Peter Kirk. Composed new music for the revival of “1864”, staged at House of Asterion (Aterions Hus), 2009. Produced an ‘Artist in Residence’ course at Ganløse School, as preparatory work for a CD project with Year 2 pupils from Ganløse School. A philosophical audio poem released on CD autumn 2011. Played the music for composer Anna Weiser’s work for percussion and movement, “A Butterfly in the ear” (En Fjäril i örat). The work was performed in May 2010, on the Swedish island of Gotland. In connection with the nationwide project for Danish charity Ibis, “The whole world in school” (Hele verden i skole), I have composed and recorded the support song “Angola, Angola”, with all proceeds going to children in Angola. In the spring of 2010, Brita Haugen released her book, “Penelope’s Voice” (Penelopes Stemme), with pictures by Kirsten Klein and music by Christian Risgaard, and improvisations by Charlotte Nordholt and myself. In August 2010, I participated in the Harbour Symphony in Rostock, where I played with the symphony orchestra and ‘bådenes tyfoner’. I compose music for orchestras, theatres, projects and films. I started in earnest to compose when I was commissioned to compose music for “Mac&Beth”, a production at Theatre La Balance, directed by Marc van der Velden. Recently, I have composed music for the French/Kyrgyz film “Tengri, the blue sky” (Tengri, le Bleu du Ciel), by Marie Jaoul de Poncheville. The film was shown, at among others, the Cannes Film Festival, Cabourg Festival and festivals in Germany, Italy and the USA. The film had its premiere in Paris on 28 April 2010. A few words about the concert “Ritual’s Sound”, from parish priest Helle Jeppesen, Rødovre church. With the concert “Ritual’s Sound”, Birgit Løkke explores a series of percussion sounds that cannot avoid probing and opening the mind. Curiosity and imagination awakened by the unfamiliar and yet still recognizable sounds. Do all people have a common sound-universe? And with what sounds do we approach the holy? Maybe the different religions and peoples have more in common if we follow the way of sounds. The church is actually better off – temporarily! – being wordless, and instead filled with these sounds that bring forth inspiration from, among others, the Canadian wilds, but they also adapt themselves well to fit into the confines of the church. The concert is for all who dare to listen in a nuanced way, and it is suitable for confirmations, if music and church-bias needs to be challenged. 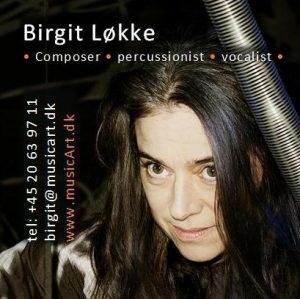 Birgit Løkke is both a very exciting composer and an impressively skilled percussionist. And she is brave: she dares to play the sounds of her soul and gives her audience an exceptional musical experience. Beautiful installation art with newly composed music and custom made instruments. Dance and movement. A sensory experience. For this event I tell about my compositional work and where I find inspiration. Also, I play examples of the music, while excerpts from the film are shown. There is the opportunity for a discussion afterwards. I have composed the music in collaboration with Jesper Siberg, and the show is performed in Helsingør in August/Sept. 2011. A wonderful, beautiful book by Brita Haugen, which I’m proud to be a part of; with pictures by Kirsten Klein, music by Christian Risgaard and improvisations by Charlotte Nordholt and myslelf. Improvisations of beautiful 3D weavings by Anna Thule. A beautiful installation suitable for galleries, cultural centres, etc. Vietnamese temple gongs, Tibetan singing bowls, balophones, a santur from Iran, an udu from Gotland, and various sound instruments made by Steve Hubback and Paiste. Drums and bells from many parts of the world, log drums, kalimba … .. and so on.